Our last morning at Bwindi we awoke to find this fine little frog clinging to our tent. I took the photo in almost total darkness and didn't know how colorful this little guy was until I got my slides developed. 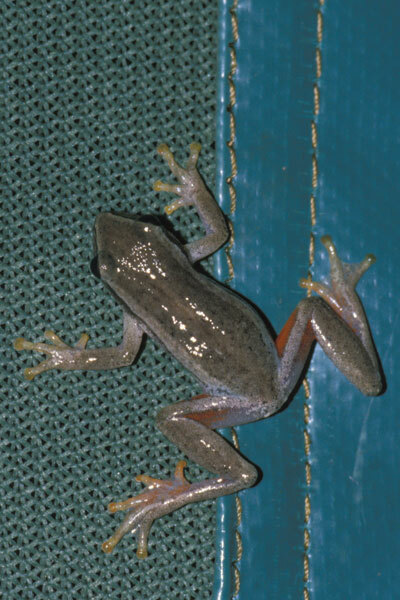 Drewes' site lists several small frogs from Bwindi. My initial guess was H. kivuensis from the pattern, pointed nose, and red on the hidden parts of the legs. But Mr. Drewes was kind enough to correct my guess -- this is a male H. cinnamomeoventris, which is very similar to H. kivuensis with the primary distinguishing factor here being the white stripes on the sides of the back ("dorsolateral stripes").